I actually got this idea from a similar idea on Pinterest. It was easy to do and came out great. I will be able to hang it up every Thanksgiving for years to come. Follow the step-by-step directions below to make your very own little hands turkey keepsake craft. Step 2: Out-line that canvas in gold paint. It gives the picture a nice touch. Step 3: This part can be tricky depending on the age and personality of the child. Like I mentioned earlier my daughter is 1 going on 2. I found it easier to have one paintbrush per color to speed up the process. It worked out well. I painted her hand and thumb brown, and then red, orange, yellow and green on the remainder fingers. Step 4: Stamp your child’s painted hand on the lower right part of the canvas. Then I cleaned her hand with a baby wipe. 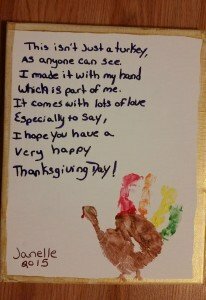 Use red paint to make the wattle and use brown paint to make the turkey’s legs. Step 5: Let dry, then hang for an excellent Thanksgiving decoration and keepsake.